Westlake – Moving Money Around – For Another Acquisition? “Slow and Steady Wins The Race” may be the driver of current and future outperformance for the Industrials and Materials space in aggregate, with some real winners and plenty of good stories. The global economy has been growing for years – slowly – but growing. While the financial crisis may be seared into the brains of many of my generation like it was yesterday, it was more than 8 years ago. 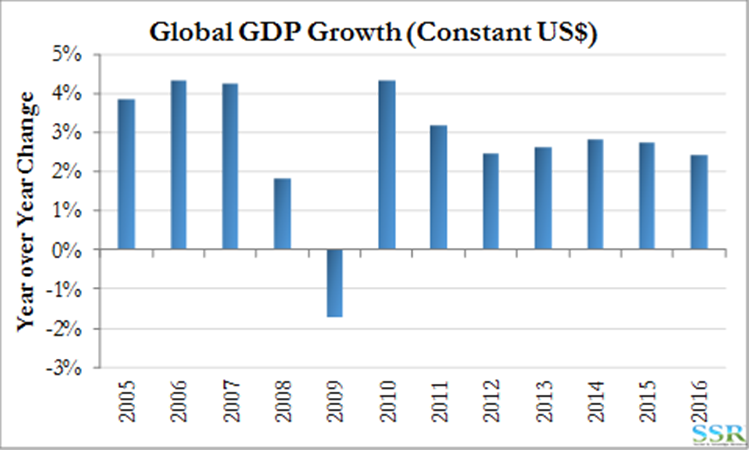 The global economy has grown every year since then – chart. Note that this chart is in constant USD – in current dollars global GDP fell in dollar terms in 2015 because of currency moves. Slow growth has been a deterrent to investment, as a general drive for productivity has slowed material demand growth – except for a few areas (polyethylene and aluminum for example) and the overhang of capacity, mining, chemical, metal or otherwise from the crisis has also deterred investment. But 2.0-2.5% growth for 8 years sneaks up on you! Cumulatively that is around 20% growth over the 8-year period. Have we run out of aluminum? – Finally! Have we run out of ethylene? We probably have enough iron ore capacity to see us into the next millennium, but many other materials are bumping up against availability to supply, or so it would appear. The other quiet trend (missed because of productivity gains) is wage inflation because of skill set shortages. The wage inflation only adds to the motivation to automate at the factory level – driving demand for the leading-edge equipment and software providers – such as ROK, PH and ITW – see recent research where we note that these names may have more upside despite high valuations relative to history and a skeptical sell side, because of strong earnings momentum. 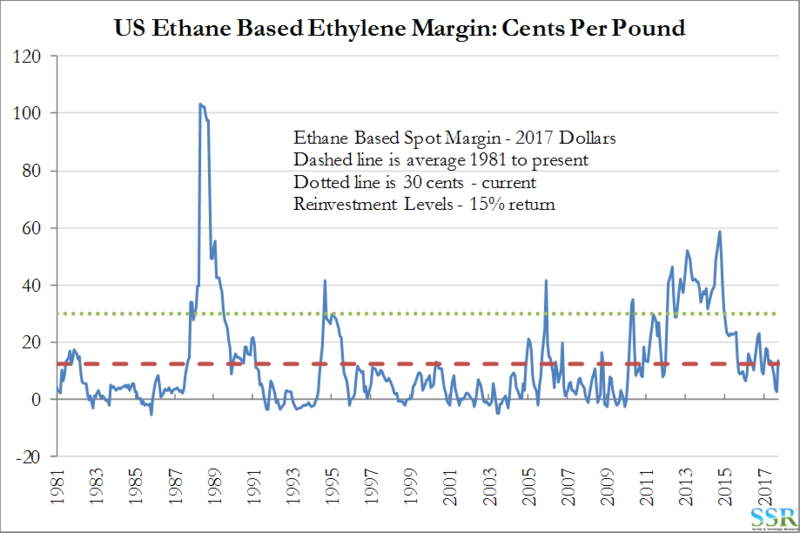 While we have been quite vocal about our thoughts on a better ethylene cycle – starting immediately – I was recently reminded by a client I have known for more than 20 years that I have never previously, at any time, been bullish on ethylene – so this is a new thing! Back in the late 90s and early 2000s we wrote consistently about the limited likelihood of a prolonged ethylene cycle – like the late 80s – ever happening again was remote, with the reasoning being in part because that cycle had happened. Everyone in the business wants to enjoy an upcycle, but people keep building because they want to participate. So, what is different this time – and are we the ones missing the point, or is it others. 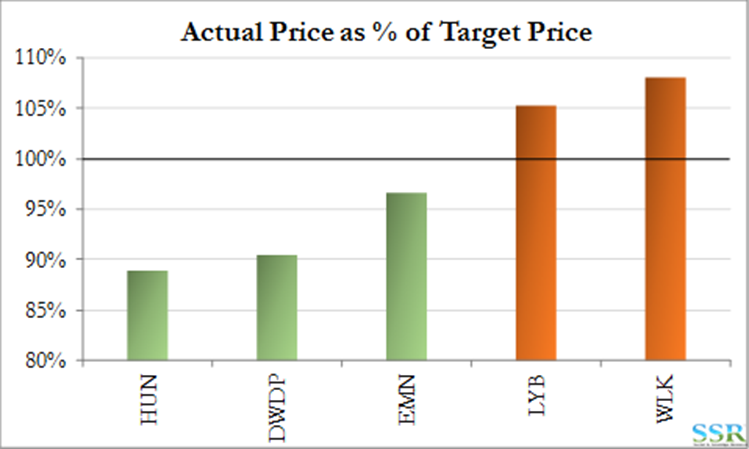 Both WLK and LYB are trading well above sell-side consensus target prices today, and while WLK has seen a recent upgrade, LYB has not seen anything yet. No geopolitical shocks – a continuation of the slow and steady economic growth we are experiencing today – see above. The US Hurricane damage causes a step change in US building products demand in 2018. Lost supply in the US tightens the global market now – even as new US capacity starts up. … older capacity cannot achieve the run rates and run times that it could 30 years ago. It is much easier to find reasons why all of the above will not happen rather than reasons as to why they will. Historically the bullish arguments have generally been wrong, but more often than not, sound supply/demand reasoning has been tripped up by an economic shock – and that is the risk here also. We do have a couple of possible triggers – such as Brexit and North Korea – but there are always a couple of possible triggers and it is generally a surprise rather than something you are watching that catches you out. This time part of our thinking is driven by a combination of 2 factors – the sheer size of the ethylene market and the level of new capacity required each year to keep up with even modest demand growth – and the escalating cost of construction. Add this to an historic margin chart that shows that profitability has never provided a long enough period of adequate returns for the industry – see chart and prior work. To add 6 million tons of ethylene capacity per annum (4% growth) would cost a minimum of $15 billion a year. If we are right on ethylene, WLK could use a solution for the ethylene deficit at the Axiall business given that we are likely still 2 years away from the start-up of the JV ethylene facility with Lotte. Eastman has made no secret of its interest to sell its ethylene units, with Westlake most likely the only bidder in our view. This week we saw WLK sell additional ethylene capacity to its MLP, Westlake Partners, with Westlake Partners selling $100 million of equity to partly fund the purchase – which was $229 million in total. WLK raised roughly $3.4 billion in debt to acquire Axiall ($2.4 billion to buy the company and assuming $1 billion of Axiall debt) – repaying an acquisition loan with new corporate debt in Q1 2017. WLK has no debt due until 2021. Raising equity at the MLP level and then selling assets to the MLP is a creative way for WLK to raise the cash that would likely be needed to fund a small EMN ethylene acquisition. EMN has been talking about selling more than just the ethylene plants. On their own we would not expect them to cost WLK more than $150 million, but if WLK is buying other assets at Longview also, the price tag could be higher. WLK already owns the pipeline infrastructure to get the ethylene to the grid and Lake Charles. This would likely be seen as a good deal for both companies – EMN may be selling as the ethylene market is turning, but as we show in the Exhibit below, it is not much of a game changer for EMN and would get rid of a cyclical distraction from the portfolio. Plus EMN would finally be living up to a commitment that it made to shareholders more than 3 years ago. The incremental earnings from such a deal for WLK, if ethylene rallies, would be much more meaningful as the earnings increment is a larger proportion of 2018 WLK consensus earnings than EMN. 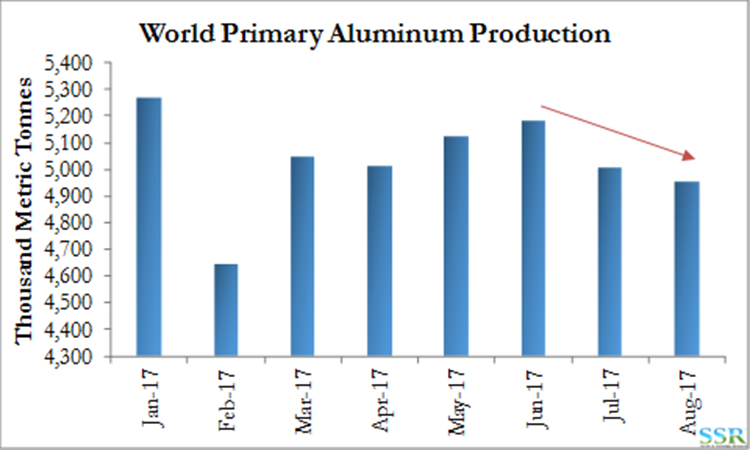 Aluminum has had a good run, driven by solid demand growth and slowing production – first chart. Pricing is now at a 5 year high (second chart) and Alcoa has moved with pricing – the stock being the best performer of the year in our broad group. But while the stock has done well, either it should do better, or the metal price is going to fall again – there is an arbitrage. Estimates for AA for 2018 now discount a decline in pricing aluminum pricing versus 2017 – see table. 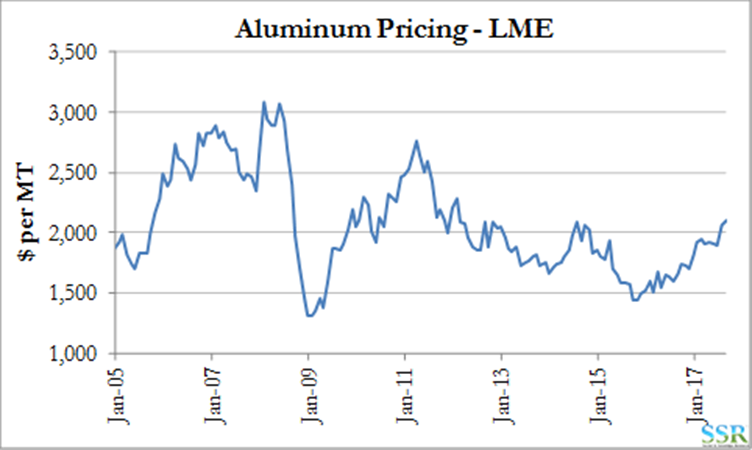 This is against a forward curve for aluminum, which, while uninspiring and highly mechanical in nature, suggests that prices will rise. So, either the forward curve is wrong or AA’s estimates for 2018 need to increase, which would give more upside to the stock. If our argument around the global economy holds up – see first section – then AA has further to run. 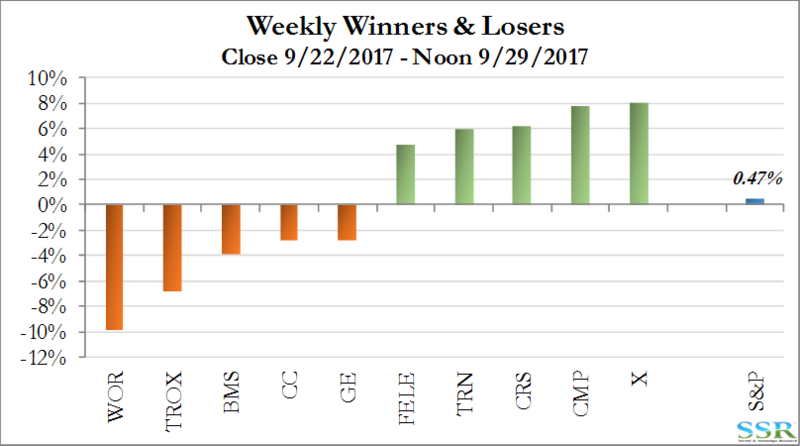 Two weeks ago, we began out Friday Findings with a short write up on Covestro – making the comparison with Trinseo as Bain capital sold down its stake – relinquishing control – coincident with improving industry fundamentals. Covestro has outperformed since the Bayer sell down mid-month and Bayer has sold a further 6.7% today, and explicitly released Covestro from its voting control. Bayer and the Bayer pension fund now control around 35% of the outstanding shares. Our expectation is that the fundamentals of Covestro’s two main businesses will continue to improve and that with greater expected liquidity (the shares sold today are locked up through December) the stock looks like one of the more interesting in the European space – we see another 15-20% upside.